Our Get Lit! issue is getting replaces on newsstands today, but the festival continues through Sunday. Browsing the events is easy if you kept a print copy, but you can also find the remaining events listed on page 52 of this week’s issue or the Get Lit! site. 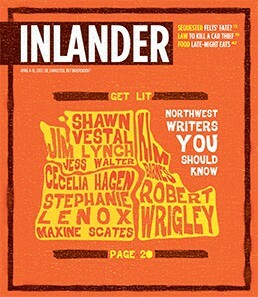 This year we focused on some of the excellent Northwest writers participating in the festival, with stories about Jim Lynch, Shawn Vestal, Nance Van Winckel and Jonathan Evison. We also have features on headliner Joyce Carol Oates and poet Major Jackson. 9 pm • free • 21+ • Women’s Club • 1428 W. 9th Ave. This was a big hit last year — how could it not be? — so it’s back for a second time. With writers Kim Barnes, Dan Butterworth, Jonathan Evison, Kate Lebo, Sam Ligon, Jim Lynch, Laura Read, Marianne Salina, Greg Spatz, Shawn Vestal, Jess Walter and Robert Wrigley. 9:30 am • free • SCC Hagan Foundation Center • 1810 N. Greene St.
Last fall, for the first time in 14 years of Humanities Washington’s Bedtime Stories, the event was held in Spokane. The writers who created original works around a single event prompt — “red eye” — will read and chat once again. With Kim Barnes, Shann Ray, Nance Van Winckel and Jim Lynch. 7 pm • $15 • Bing Crosby Theater • 901 W. Sprague Ave.
During her prolific career, Oates has written dozens of books, essays, plays and other works. She was selected for Oprah’s Book Club and chastised by Stephen King for making her new “challenging, problematic, horrifying, funny, prolix” book so difficult to review. But most people thrilled to see her speak don’t need reviews and book clubs to tell them why she’s one of the nation’s most famous living authors. 5 pm • free • Barrister Winery • 1213 West Railroad Ave. These three guys are excellent Northwest writers, but they’re also friends. Ligon probably already knows all the best topics to raise since he helped shape Walter’s We Live in Water and Vestal’s Godforsaken Idaho, but the conversation will also include the audience, in case you want to ask Walter about his new movie deal. “The meditative practice of both reading and writing poetry began long before I started writing, maybe even long before I started reading,” Jackson says in our feature. Both poets will read from their latest works. Regional MFA Reading and Inland Northwest Faculty Reading 2 pm and 4 pm, respectively • free - Barrister Winery • 1213 West Railroad Ave.
Camp out at Barrister Winery with a bottle for two reading sessions. First, hear from graduate students from around the region. Then hear from the instructors.